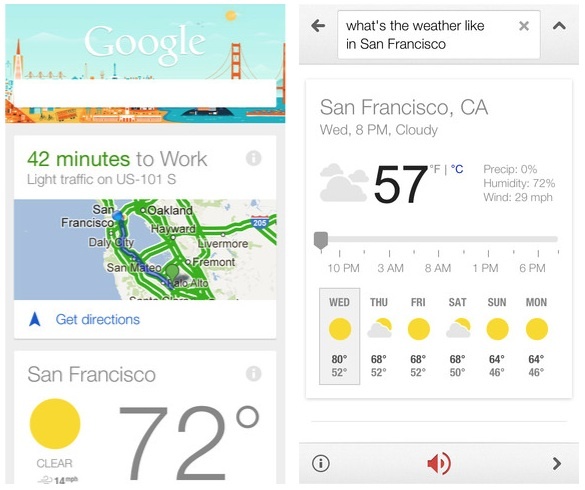 'Google Search' for iOS Updated With Google Now - iPhone.MY - Daily News On Mac, iPhone, iPads, iPods and more! Last month, Google briefly leaked a video showing that its information aggregation toolGoogle Now would be coming to iOS. Several weeks later, Google chairman Eric Schmidt was asked about Google Now for iOS, and he noted that “you’ll need to discuss that with Apple”, although it was later confirmed that Google had not submitted a version of Google Now to the iOS App Store. Roughly a month later, Google Now has now appeared in the App Store as part of a revamped version 3.0 of the company’s Google Search app. The look and feel of the app is virtually identical on both platforms, a testament to Google’s newfound ability to make well-designed apps on iOS. The main differences between Android and iOS are few, mainly in that iOS can display fewer different kinds of cards. “The types of Google Now cards available are largely the same on both platforms,” says Baris Gultekin, Director of Product Management for Google Now. On iOS, the Google Search app can’t be launched with a system-wide shortcut (unless you are a jailbreaker) and it can’t do the same kind of background sync that Now can do on Android. However, Google tells us that it will support the iOS background location feature, so that at least it won’t need to spend as long hunting for your position when you open up the Search app. Google reports that 22 of the 29 card types found on the Android version of Google Now are making their way to the iOS version, with airline boarding passes, Fandango, and local events being among those not making the transition.